New Tascam Model 24: Reactions? Discussion in 'Model 24' started by SocProf, Aug 28, 2018. I was wondering when the DP series would get a make over. With Zoom releasing the LiveTrak series, the competition was heating up. I will need to spend more time reading through the features, but so far I'm impressed. I didn't see an estimated cost yet--hopefully it won't be an arm and a leg. "And in between live gigs, the Model 24 serves as the ideal songwriter’s companion with full record, overdub and punch in/out capabilities." If I'm reading the above correctly, it does not have editing capabilities, but assumes you will do that in a DAW. In other words, it will not function as a full portastudio like the DP series. If true, that is disappointing. It’s really nice to have one knob per function instead of having to hit “mixer” on every channel to set up the mix, making mixing a faster operation. But, we lost a few things. It looks like this doesn’t have the amp simulator the DP32 and DP24 have; I also do not see a USB interface for downloading songs from the unit without having to eject the SD card in use. Also, the track count is smaller; we have 22 tracks (12 mono, 5 stereo) which is lower than the DP24 (12 mono, 6 stereo) and DP32 (8 mono, 12 stereo). Also, it looks like we might not have the mixdown/mastering function the older DP series has; I do not know if one has to hook it up to an external recorder to perform a mixdown. The EQ is more basic than on the DP series; the low and high shelf EQs now have fixed bands. This, all in all, looks to be a good next step for the Portastudio series, and an important upgrade. That said, I hope they end up making a Model 32 with more tracks. There is a USB interface--look at the rear view in the gallery. I suppose we will have to wait for the manual to get the full picture, but I believe you are correct that mixdown and mastering are gone. Like Zoom, they must expect people to do this with software. However, if you hang on to your DP24 or 32, you could import tracks recorded on the Model 24 (taking advantage of the upgraded inputs) and do the mixing and mastering on the older unit. I think they've got hip to the fact that a lot of folks still want to track/capture with physical faders and knobs - but want to mix, polish, and finalize in a DAW. Do we know how much it costs? I'll bet the msrp will be north of US $1,500. Edit: Sweetwater has msrp as $1,300. it measures 22.67" × 20.20" × 4.43" / 576 × 513 × 112.5 mm (including knobs and connectors) and weighs 22 lbs. Reminds me a bit of the old TASCAM M Series Mixers. It’s only $1000 (preorder pages are already up at Sweetwater and Zzounds), which is cheap for what this offers. I wonder if it’s possible to use the desk as a big control surface, but I would doubt it at this price. Also, if it’s an interface, it may be possible to have a DAW (or even just Audacity, depending on how the interface interacts with the computer) hooked up to record mixdown takes without a DA/AD conversion. I wonder if it supports 44.1. Based on Tascam’s history, I would say “probably”. "Beyond the ability to simply move recorded tracks to and from a DAW, the Model 24 is also designed as a powerful USB Audio Interface, complete with premium quality mic preamps and onboard compression. Ideal for project studios, the Model 24 will provide 24 simultaneous inputs to a computer based recording system, making it incredibly easy to record multiple musicians simultaneously without the frustration of channel limitations. The Model 24 also provides incredible flexibility at mixdown by making it simple to work completely in-the-box, or route tracks back through the mixer for 22 channels of hands-on control and true analog sound." The $1000 price tag is exactly the same as the Zoom LiveTrak L-20, and obviously not a coincidence. It will be interesting to see which one sells better. Tascam has the advantage in terms of knobbiness, but that comes at the cost of a larger size. The Tascam also weighs almost 3x as much (22 lb vs 8 lb). I know it's a long shot, but I hope Tascam comes out with a new flagship portastudio that uses some of the same technology as the Model 24, which presumably is using some of the same technology from their USB interfaces. However, I'm willing to accept the possibility that the standalone portastudio might be dead, other than the small portable ones like the DP-008EX. 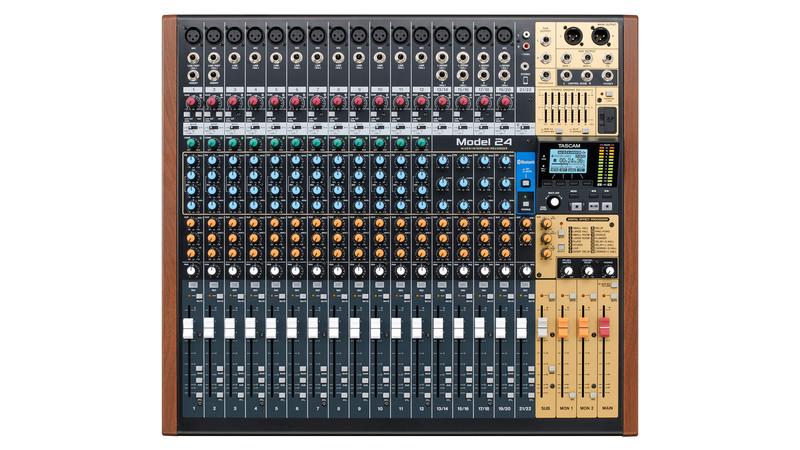 I think this Model 24 is the new flagship Portastudio from Tascam. I wasn’t expecting for them to come out with a post-DP32SD (actually post-DP24SD, which came out after the DP32SD) Portastudio, so the Model 24 is a pleasant surprise. They are marketing it as a live mixer/recorder, but it allows individual tracks to be armed and supports punch-ins, so it’s, for all intents and purposes, a big heavy Portastudio. I don’t think they will stop selling the DP32SD lineup even though this exists; the DP32/DP24 lineup is for home studios; the Model 24 is for live sound (but the Model 24 can also be used as a home studio). Different niches with different needs. Sorry, I wasn't being clear about my terminology. By "portastudio" I was talking about a unit that can do the entire recording process from laying down initial tracks to editing to mixing to mastering. Neither the Model 24 nor the LiveTrak series fall into this category. I am hoping that Tascam will release new versions of the DP24/32SD with upgraded preamps, A/D converters, and effects. As this probably will not come to pass, then I agree that the DP24/32SD are likely to stay in production, at least in the near term. I love actual knobs and sliders, which is what led me to the DP. That thing looks DREAMY! rob sheard and SocProf like this. I've never used my DP24 for anything but tracking ... everything else is done on my iMac. This looks interesting. A very familiar interface ... and MUCH better than the DP screens and nested menus. I'm considering it. Wow, I will buy one when the Neo conks out, maybe sooner . I wonder if we will be able to see the track waveform on the screen for precise punch-ins. I don't see anythng about virtual tracks...my feeling is that it's "something less" as a recorder, to have "something more" by other points of view. Oh, and another question: the foot switch it requires is "TASCAM RC-1F Foot Switch"
It's impressive it can write 24 tracks simultaneously to the sd-card - will be interesting to compare the sd-card compatibility list with the dp24/32 one. Not sure about the DSP effect. I've a suspicion it's going to be similar to the dp24/32 'guitar effect' and can only be used on one track at a time, so if you want to process several tracks with different effects, it will be just as frustrating... but I hope I'm wrong. Bottom line for me is it's frustratingly short of my ideal studio machine. If the DSP has limited concurrent use, I'd still be tempted to use external gear or a DAW for processing recorded tracks and bouncing/mixing down... in which case, all those knobs on the inputs (which are superb for live use) become superfluous as I might as well leave those decisions till later. Will know more when the manual appears... block diagrams anyone? I already searched for the manual for that very reason... interested in seeing the block diagram. If anyone wants to check out the competition, Sound on Sound magazine's review of the Zoom LiveTrak L-12 is now available for free consumption. I know the L-20 has more tracks, but I haven't done a side-by-side comparison of the features. Apparently it has a few more.